Pinterest can without a doubt prove that DIY's are all the rage lately! From refinishing furniture to creating your own little terrarium, this idea of recreating something you love at a fraction of the cost has become the talk of the town! And let's be honest...who doesn't want a little extra cash to splurge on that boutique dress you have been dying to own! Maybe you are planning a baby shower or just looking to add some personal touches throughout your home, but not looking to spend the money it takes to get the exact look. Lucky for you we have put together some of our favorite DIY's that will give you the tools you need to add your own touch to your next DIY project. Never DIY'd? Don't worry you'll be a pro in no time! We have to agree with our parents, they just don't make furniture like they used too! So, why throw out that old piece when all it needs is a little TLC or should we say DIY?!? 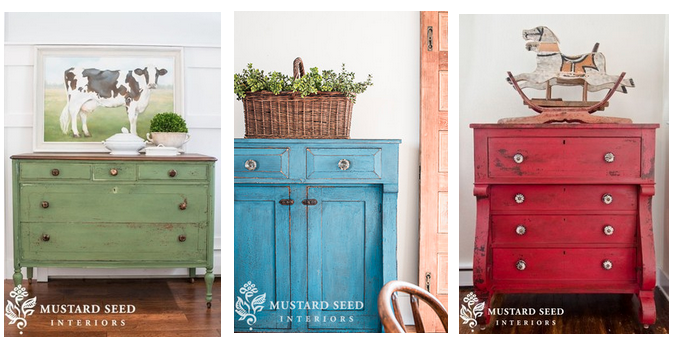 The idea of refinishing a piece of furniture can be daunting, but with the help of Miss Mustard seed Milk Paint you're moments away from a before and after you thought you could only dream of! This easy to use powdered paint will change the look of a room with the swipe of a brush- get ready!!! Miss Mustard Seeds Milk Paint is a powdered, all natural paint who's concept has been around for centuries! Its a versatile paint that can be used to achieve that chippy, distressed look or that smooth sleek look. All you do is add water and voila! We found Youtube to be super helpful when trying to get the look we wanted! Milk paint is quick easy and forgiving- emphasis on the forgiving part! Now, enough of the rambling- let the pictures do the talking! On a side note wouldn't your wooden monogram look great above one of those....I mean we're just saying! Who knew the paint on that awful squeaky chalkboard was going to be all the rage in the DIY and Decor world. From wedding decorations to wall art, chalkboard paint will give you a fun and easy DIY project that you will find many uses for! Chalkboard paint can be found in most home improvement stores like Lowe's, Home Depot, and Walmart! However, you may find the price tag to be a little to deep for your pockets. So, our good friend Martha Stewart has given us the perfect instructions on how to make our own Chalkboard paint in our favorite colors! All you need is a flat finished latex paint in your favorite color and unsanded tile grout the rest are simple ingredients! Making your own chalkboard paint will not only give you the look you want at a fraction of the price but your going to have enough left over ingredients to use on your next chalkboard DIY! Can't figure out what to paint? Well thanks to Pinterest your chalkboard paint DIY ideas are a click away! 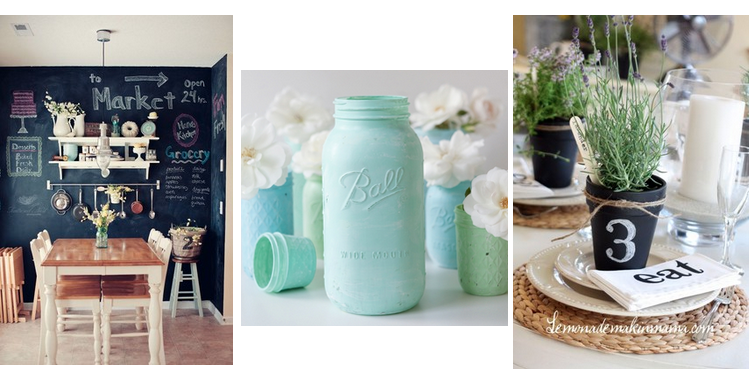 Amongst those ideas is our personal favorite - Distressed Chalkboard Mason Jars! I mean mason jars in general have been such a huge tool for decorating lately, but adding a touch of color makes our heart smile. Add a fresh bouquet of flowers Or sprig of herbs to make the perfect center piece that everyone will rave about! We think it's safe to say that the color and pattern combinations Lilly Pulitzer has created over the years are simply addicting! The rich, vibrant and bold colors featured in her designs keep you wanting more. So, we decided to take the below Lilly inspired wall and make it into our on a little DIY adventure! This very DIY can be done so many different ways with so many different types of materials and patterns. However, For this particular DIY we are going to focus on incorporating Lilly Pulitzer Vintage fabric pieces into our home in a fun and affordable way! Maybe your looking for that perfect collage to put over your bed or dresser, well your just a DIY away! 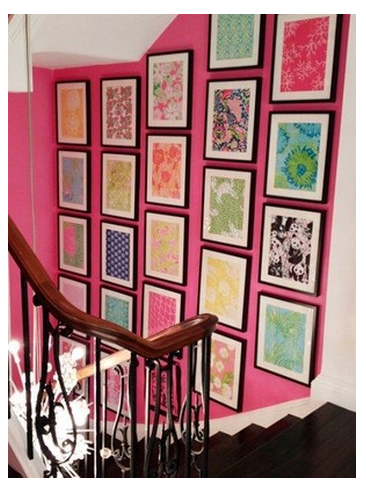 Now, that you have all your materials your moments away from a fabulous Lilly inspired wall art! Step 1- lay your fabric flat on a solid even surface (may need to iron your fabric before incase there are wrinkles), Step 2- lay your canvas board face down evenly on your piece of fabric. Step 3- apply your Glue/adhesive to the back boarders of the canvas board OR if you are using a staple gun begin stapling one side, then move to the opposite so you can pull the fabric tight. Step 4- fold fabric over the back board of canvas board where glue/ adhesive was applied. Make sure to pull tightly to avoid wrinkles or creases. Step 5- once you have folded all the sides its time to work on the corners where you have all that excess fabric. All you need to do is take the loose fabric and pull it up and back towards the center of the frame. One side will fold at a diagonal along the side of the frame. Just make sure you smooth out the bumps and staple OR glue the corner in place. Once you have done all four corners you're done! Now, wasn't that easy?!?! More of a visual learner? Check out this step by step picture guide! 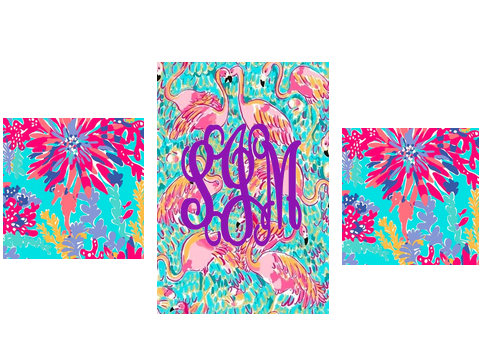 Now, for all you monogram lovers out there this next step is for you! Since Vinyl will not adhere to fabric permanently you will need to Mod Podge your already assembled fabric covered canvas board. Just place you monogram in the center of your fabric covered canvas and apply the Mod Podge Matte evenly with your foam brush, following the drying instructions on the back of your Mod Podge bottle! Once your Mod Podge has dried your ready to start hanging your collage ! See, wasn't that simple? Want a Lilly Pulitzer Themed room? Hop on over to Garnet Hill to check out their exclusive Lilly Pulitzer Home Collection- it's to die for! There is nothing better in a home then fresh flowers or plants. It just makes a home feel like home. Now, terrarium's have always existed but only in the last few years have we begun to see them incorporated into the design and decor of homes. Yes, you can buy a fake looking terrarium that will probably cost you anywhere between $20-$75 for a real looking one. But, why do that when you can just make it a DIY at a fraction of the cost? Now, when it comes to simplicity I think we can all agree easier is better, right? So, thanks to World Market we found a simple 3 step guide on how to make a terrarium! If this guide doesn't help you, no worries there are tons of videos out there giving you step my step instructions on how to make a terrarium! We also, fell in love with the glass terrarium containers at World Market! Now, that doesn't mean you gave to go buy these exact ones! 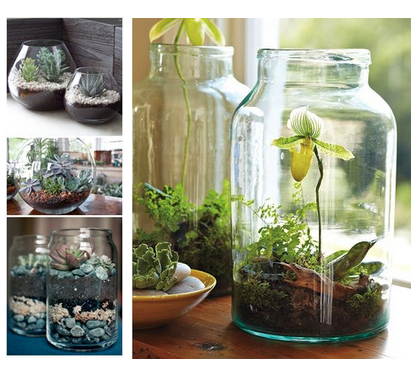 We love this DIY because you can make a terrarium in that old mason jar you have had sitting in your cabinet for years! This DIY is not only great for your own home, but they make amazing gifts! Not to mention with the left over materials that you will have it will be the gift that keeps on giving! Now, you got to love that! This is just the tip of the iceberg when it comes to DIY projects! 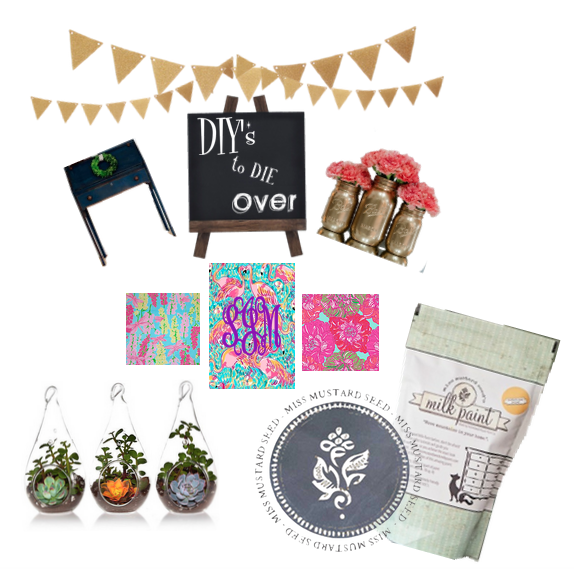 So, go get those hands dirty and starting Pinning your DIY projects for the world to see!